Please inform us of your eye emergency as soon as possible so we can adjust our schedule to see you. If an emergency occurs outside our normal clinic hours, Dr. Meek may be reached at (801) 971-4660, however, if you are unable to reach us please go to the nearest emergency room. We consult and co-manage LASIK, cataract, eyelid and other surgical procedures Let the staff know and we can give you a free LASIK consult with your eye exam. Glaucoma is the silent thief of sight. It is estimated that there are one million undiagnosed cases of glaucoma in the Medicare population. There are many exciting new glaucoma medications that control the eye pressure and save precious eyesight. 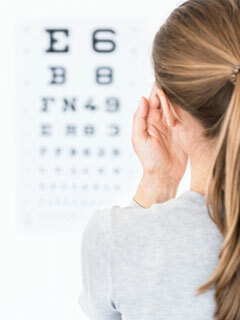 You need an eyecare professional to diagnose and treat glaucoma. The eye pressure may be normal but glaucoma may still be present. This instrument assists in detecting glaucoma, stroke, M.S., neurological problems, brain tumors and unexplained headaches. This test only takes a few minutes but gives the Doctor valuable information on the health of the eye and the entire body. We like to think of it as a mini MRI. Many times insurance companies will pay for this test. Punctal plugs are used for patients with moderate to severe dry eye symptoms. Inserting punctal plugs is a safe, simple, painless procedure that brings relief to dry eye patients. It prevents more of your natural tears from draining away from your eye thus keeping your eyes moist and comfortable. We have performed this procedure on many patients with great results. Please call for a consultation to see if your are a candidate. Most medical insurance companies pay for this procedure. Our optical dispensary has the highest quality designer frames including: Ray Ban, Oakley, Jill Stuart, BeBe, Revlon, Nike Flexon, Tommy Bahama, and Zeal Sunglasses. Polycarbonate lenses (thin and light). We also have frame and lens packages to fit most any budget. We feature a full line of prescription and non-prescription sunglasses to protect your eyes from the damaging rays of the sun. Our in-office optical lab gets your glasses made quickly. Visit our dispensary anytime during normal clinic hours. We do fill other doctors prescriptions.